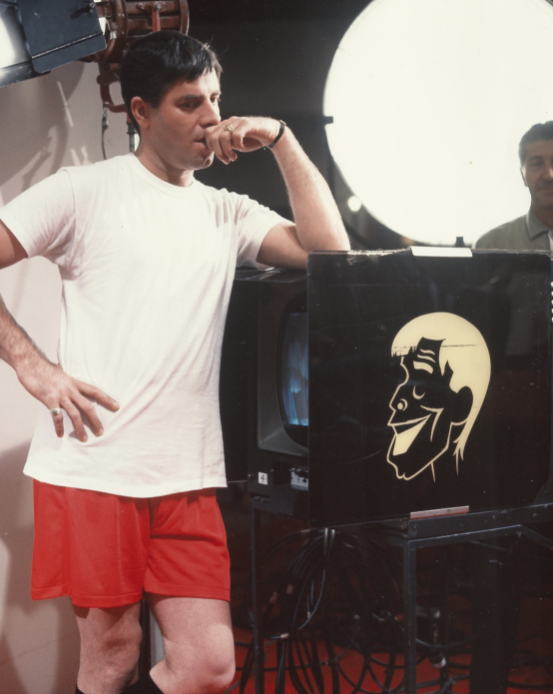 A series of posts paying homage to Jerry Lewis, his world and the world through him. Don’t try to sound wise or informed about Jerry, don’t try to shed light. He rejects being understood, quite properly, and his impulses live in darkness. At any rate, nobody really knows anybody in this life, we’re all surprises—a fact Jerry’s every twitch elucidated. The countless commentators who worked through the decades to label Jerry, judge him, pass sentence, never sat with him at table, yet eagerly framed him in personal, not professional, terms. We never met, but I always cherish a tiny moment caught and held by Martin Scorsese in The King of Comedy, where a man I take to be very like Jerry, named, of course, Jerry, pauses in the atrium of his New York apartment to watch Sam Fuller’s Pickup on South Street on his television: the penetrating regard, the poise, the suspension of breath, the meticulous air of analysis (which I take to have belonged to both the onscreen Jerry I watch there and the real Jerry playing him) give me a thrill, as though in working to scrutinize this TV watcher I am picking up some of the mojo that is already his, in watching the film on his screen. Perhaps Jerry Langford isn’t Jerry Lewis in any way, and I’m not getting anywhere near Jerry Lewis by observing him, but I really don’t believe that. That’s the kind of world we mean. Those you see are in the daylight. Those in darkness don’t get seen. Since, watching Jerry, we sit in the darkness, can we really know what it is to suffer illumination—always unless one retreats, from every side, and with howling voices? Jerry’s performative antics were hugely visual. It is interesting that Jerry, an unwavering source of brilliance, was somehow not a source of illumination. Illumination was neither his method nor his path, although he was a blinding sun. The confession speech at the end of The Nutty Professor, where he breaks up during “That Old Black Magic,” then stands on the stage and tells the story of his life: it is pure sunshine, if also, simultaneously, degradation. I don’t think it could be called a shock, exactly, learning that he was gone. Since before November 2002, when Enfant Terrible! came out, he had been bloated, incapacitated as a result of the years of pratfalling and the pain drugs, and when those symptoms cleared he fell victim to other harassments of the flesh. And if now I would have to confess it was categorically impossible to imagine sharing the world with him, that he was out there moving around, in truth I always thought of him as being somewhere else, walking into Sulka on Park Avenue, say, to pick out some shirts, or wandering Pacific Palisades or the yacht basin in San Diego, but never in life–just as in death–present for me as a person who might walk up and say hello. In the materiality of Jerry (a taller man than one may have supposed) there was something unsettling, especially as one reflected upon it now: less that in dying he confounded the fact that one had presumed to consider him immortal, in the way that one tends to presume with stars, than that one positively needed him to keep on, to be an ultimate survivor, a defier of time who would never lose his path in the desert of the real (as Zizek had it). For some time it did become palpably clear, in the photographs glowing with the bright red sweater that screamed out against the forces of gravity, that one way or another he was waning, perhaps terminally ill—we wouldn’t be told. What afflicted him shared the mortality of his voice, his crossed eyes, his twisted run. To claim that at the end he was no longer young is, of course, an immaterial lie, because he was, young in a way that hurt us to consider: embarrassingly young, challengingly young, insouciantly young, proudly young, critically young, a person with young sensitivities, to whom rudeness was an attack. Jerry was young against the tide. He had succeeded in retaining what so many of us are pleased to surrender. And yet, now one had to use the past tense, and with every grammatical transposition away from here and now one felt a strange, metallic pang. It was charming and affronting in Visit to a Small Planet that the alien he played was all of, and nothing but Jerry Lewis, and that, coming to earth for a short while (he liked to say, “I will not come this way again”) he did not offer the creepy sagacity of Robert Wise’s Klaatu but gave instead unfamiliarity, wonder, awkwardness. Magic, which is not to imply that he acted without limit or responsibility, that he was always, somewhere underneath, “The Kid” audiences around the world came to know so well. If you watch King of Comedy or Max Rose, you’ll see a sensitive, touchy, adult human being with dignity, poise, grace, music, brains. But of course you’ll never deny to yourself that underneath all this is The Kid in full blossom, waiting, breathing, holding his breath. In King, watch the look of cold appreciation in his eyes while, as Jerry Langford, he stares at the performing Masha (Sandra Bernhard) as she sings “Come Rain or Come Shine” into his face. A man never not in the business of the show. On The Tonight Show with Johnny Carson one of those nights he was filling in, he did “One Hen Two Ducks.” Why? To this day I have no clue, hearing it over and over for decades. One hen. Two ducks. Three squawking geese. Four corpulent porpoises. Five Limerick oysters. . . . But, not trying to sound wise or informed, let me just peek at that once more. Language in pure form, words with musical enchainment. The logic of the puzzle a complete hopelessness, which is why some people—the logicians among us—go nuts trying to remember it. Six pairs of Don Alverzo’s tweezers. Seven thousand Macedonians in full battle array. Why Macedonians? Why seven thousand, not seven hundred? You have to work the phrase “Seven thousand” around your mouth a few times, begin to taste the volume and the chewiness of the thing you produce when you say those words together. Forget mnemonics, forget sensibility, forget pointing to something. Just use your mouth, and then recall how Jerry used his mouth, the mouth chewing and tasting language and soundfulness. But you also have to go on, it’s all about going on. Eight brass monkeys from the ancient sacred crypts of Egypt. (Crypts . . . of . . . Egypt. Of course there are crypts in Egypt but are they more relevant to any theme than crypts somewhere else? It is only—only!—a semantic link, the “ypt” in crypt and in Egypt, an echo and a matching so that the Egypt becomes a crypt and crypts become Egypt, both of these more deeply something unidentified, something vocal, that is, musical, that is, beyond what we can know.) Nine apathetic, sympathetic, diabetic old men on roller skates with a marked propensity toward procrastination and sloth. (Oh yes.) Ten lyrical, spherical diabolical denizens of the deep, who hall-stall around the corner of the quo of the quay of the quivy all at the same time. It is possible to mean “saying” without meaning “that which one says.” Children do this all the time. And so do drunkards. And people suffering from certain neurological disorders. And comedians. There is a revealing piece of footage showing Jerry backstage preparing to go on, at the 1979 Telethon. His world seems divided, “us” and “them.” His team includes his backstage crew, his stage manager, his control room gang, his wife, his personal assistant, all of whom take him utterly for granted as both the person that he is, a person they know well, and this for some time, and the public face he is intending shortly to put on. He can jump, or lapse-jump, into that public persona—the shrill voice, the improper comment—and slip quickly back out of it. With his team he stands calmly, quietly, looking around, checking time. How much? How much? “Three seconds.” “Oh—I can do three seconds in an hour!” It is fascinating to see the concentration, to note him noting the circumstances, who is where, who is doing what, what must he do, what is next, what must he worry about? A low, calm voice when he speaks directly to someone; then a higher-pitched, louder voice for a crowd, or for a quasi-performative instant. There is a line of majorettes dancing on camera before he is to come out, and standing backstage he quips to an unseen confederate (in a snarky tone of voice), “None of them will give birth.” Our instantaneous reaction to this—but not, perhaps, to a great deal else that he says backstage: to his comments or queries, to his listing of what must be said on camera, to his kissing his wife, to his asking a security guard to get his wife to her seat, to his affection for his wardrobe assistant—is to assess it as a clue to the deepest meanings in life, as he entertains them. And what, indeed, could he mean? That no human being will couple with any of these girls at any point to produce offspring?. . . That they dance but are barren?. . . that it is genuine creative movement they will not produce ?. . . That misfortune will befall every last one of them . . .? But he does not react to his own comment as though he means any of these things, or indeed as though he means anything at all. It is simply that the dancers are not part of his team, and so they are there. Like the audience in the auditorium and the several hundred million television viewers, they are “them.” He is distancing himself, identifying his family, his region, by pushing back the alien horde (who live onstage just as well as anywhere else), and then pushing back Ed McMahon, too, by virtue of a comment about the man’s problematic microphone that they should scurry to fix. The mic can be fixed but we can hear it’s not the mic, it’s Ed McMahon on the mic who is one of them. The moment—and Jerry’s presence in it—is utterly indicative without troubling to “say something”: “we” are here together, making this show, about to have me go on, and this complex happening—the number of people involved and the details multiplying are reminiscent of a launch from Cape Canaveral. This event we are working with enormous care to stage, and to stage successfully (so that over the 24 hours of the telecast over twenty-four million dollars can be raised), is something “we” are all in, each of us on the team equally, and I, Jerry, am merely the face, the face you are checking and fixing, the face in the tuxedo that is being politely brushed from behind, I am merely getting ready, ready to follow these interminably dancing girls, who are “other,” part of the hired warm-up. The crazy Jerry is not the Jerry behind the crazy Jerry, who works the wings like a flier. The crazy Jerry is just a puppet that Jerry and his team are working. One does not think, as one waits there, of the atmosphere into which one is about to fall. Indeed, the senses are very acute, there is a tendency to notice small, idiosyncratic things, like a small vertical tear in a near-hanging curtain, or a piece of spinach caught in the teeth of one’s hairdresser as she leans over your head, or to think, quite suddenly, of some fragment from an old story, as when one’s grandmother touches one’s face again, earliest childhood returned, and asks if one would like a boulichka and some warm milk. The sweetest politesse in all directions. The genuine smile, only that one, which is distinct from the stage smile, and only when it is justified, but broadly. I had the fortune one night to stand in the wings next to Leonard Bernstein as he prepared to make his way onstage to conduct the New York Philharmonic. He wore, over his tails, a long black cloak, and an assistant made a move—a tiny move that I can recall to this day, fifty-three years later—upward with the hands, in preparation for removing this cloak. And the maestro said aloud, in poetic reverie, “Ashrei yoshvei veytecha!,” which is the beginning of a Hebrew prayer, “Blessed are those who sit in audience to You,” and there was a distant—a very distinctly distant—gleam in his eye, because he was thinking about and looking toward some place else. Some place: the orchestra onstage in the bright light? His past? His blind future dream? Once, stepping onstage myself, I found my director by my elbow, unanticipated, shoving a lit cigar between my teeth so that as I entered I was coughing up smoke (“Perfect!” he said). And Jerry paced and stood, and turned and grinned, kissed, made comment, was concerned, was relaxed by his assistant, asked how long. “How long?” —“Three.” —“I can do an hour in three minutes.” He turned to face away, in the direction of the long dark gap. He took a second to lift up his head. He strode forward with that buoyant, athletic, Buddy Love stride. Where did the spirit enter? And who was it died, when Jerry Lewis died? Consider that the Jerry so many fans adulate today, and adulated earlier, the Jerry of Living It Up, or of Artists and Models or Hollywood or Bust; or the Jerry of The Bellboy or The Nutty Professor; or even the later Jerry of The King of Comedy, is a Jerry of memory, a Jerry of the past, which is to say, a living ghost, borne away and forward again in time (and preserved in time) from the Jerry whose life ended at the age of ninety-one. Memories change in the winds, but their status as memories does not. They persist as iconic images. And they are reproduced as such in the countless items of memorabilia, signed by him or not signed, that people collected (and collect) in order to feel attached (and show off, in order to make claim to the attachment). Iconic Jerry neither died nor was mortal, since media images are not mortal things. 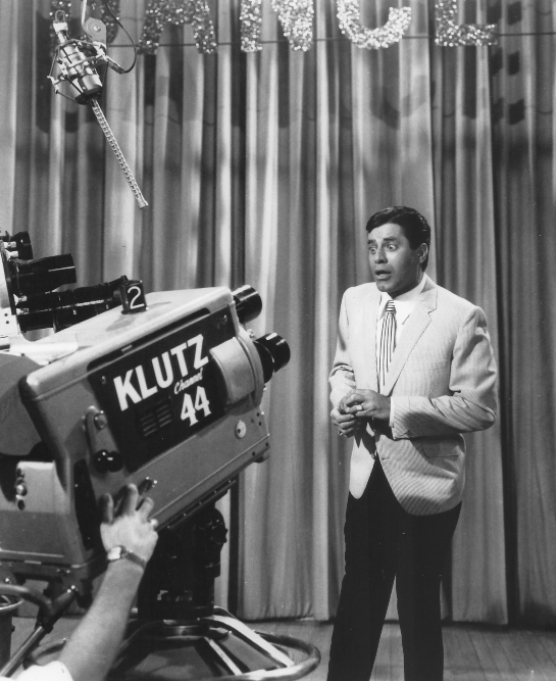 Jerry Lewis inhabited a colossal array of media imagery, such that seeing him in multiple contexts is inevitable, and the insurmountable imagery has permanence. When fans openly grieve for their lost “Jerry” they are forgetting that he was already lost, lost even when his images first showed. When The Nutty Professor opened in New York, July 17, 1963, the Jerry beneath both Julius Kelp and Buddy Love was long gone. We know there is no film of which this cannot be said. Yet with Jerry, perhaps more than with other performers, it is a fact audiences today find hard to grasp, sentimental as they are about the characterizations offered onscreen. But those characters and those sentiments are generated out of material, but immortal stuff. As to the future, we will not see him again. He would not give birth. Are you there? I’m making sound and watching your face, are you there? You smile, you nod, you talk back, you whisper in my ear. I need you to be there, are you still there? I need to touch you, I need always to be in touch with you (or to know that I can be in touch with you). I’m not talking because there’s something I want you to know, I’m talking because I want to touch. Talk as touch. So, where does the talk come from, the brain or the heart? Because only fools believe there is no difference. If there is only the stage and the audience, the stage in light, the audience in darkness (at this point in history, the point Jerry inhabited with us), touch is the problem. Are you there, can I touch you? Are you out there touching me? Can you go beyond appreciation and reach forward, so that onstage here, in this blinding light, I am not alone? If I invoke you, if I call out in some very close language, a language that hits the spine, can you feel me? It is a marvel to see and hear Jerry bellow and belt incoherently, the sound welling up from some hidden dark cave and taking shape through the curvature of the face. We get this in The Disorderly Orderly when he listens to patients’ symptoms and instantly suffers from whatever horrendous condition they are describing. Or when, pushing the brake pedal of an ambulance too desperately his foot goes through the floor and starts smoking as it skitters along the road: “Pain! Pain!” Or when he is in a fast flow of traffic, standing alone among the cars, and something ominous is speeding into his face. Vowels and consonants put together as comic-bubble squeal. Words that are no longer words, words carried back to their origins in the feelingful (the sentimental) body subjected to conditions. Or the helpless, profitless attempts at well-behaved articulation, the wholly civil Jerry, as when Julius Kelp needs to explain something to his Dean (Del Moore): “Wel-elllllll . . . ahem,” with the tongue emerging from the teeth. Meaning only goodness, trying very hard. We cannot ask for more. But unable to meet the (vicious) demands of modernity, the compelling militaristic, heartless, incompassionate orders from above, and because of a nature over which he has no authority. “Use your authority./ If you cannot, give thanks you have lived so long.” Unable, not unwilling. Unprepared—that is, unindoctrinated. Jerome K. Jerome being welcomed at breakfast in the girls’ boarding house in The Ladies Man (by the Brünnhilde, Helen Traubel): speechless, flailing, turning and turning to find the answer in the air, who-what-when? We have all been there, initiates to a much cultivated ceremony that we do not grasp, whose features are all mysteries, and surrounded by a coterie of uninterested insiders who have forgotten their own initiations and treat us like dirt. We have all been there, and have forgotten. When he invokes the memory, we resist. We say, with our lips turned down, “Such a clutz!” Indeed, clutzes we are all, but have forgotten, thinking now, in our elegance, that because we are socialized, because we survived the torture that Jerry never escapes, we were always naturally this way, always cool, and it is only with him that there is something very wrong. I love the delicate way he sings Arthur Schwartz and Howard Dietz’s “By Myself” in The Delicate Delinquent, because, as need hardly be said, in the late 1950s so many people took delinquency as a serious problem they were incapable of conceiving how a delinquent could be delicate; and here, with this rendition, he is everything of delicate and at the same time, because such a bad fit, everything of a delinquent. In The Band Wagon Fred Astaire had come close to making an anthem of this song, as he walked the platform at Grand Central in the shadow of his former glory. But Jerry’s version is simpler, cleaner, less orchestrated for the voice, the simple, unadorned Sidney Pythias voice: “I’ll go my way by myself, this is the end of romance . . . I’ll face the unknown, I’ll build a world of my own.” This wasn’t long after his breakup with Dean, this Pythias’s Damon and his daemon, too. Hollywood or Bust, his previous film, had been their final collaboration. The romance that was ending was Jerry’s and ours, but only those old enough to remember watching Dean and Jerry together will fully feel nostalgia for that loss. 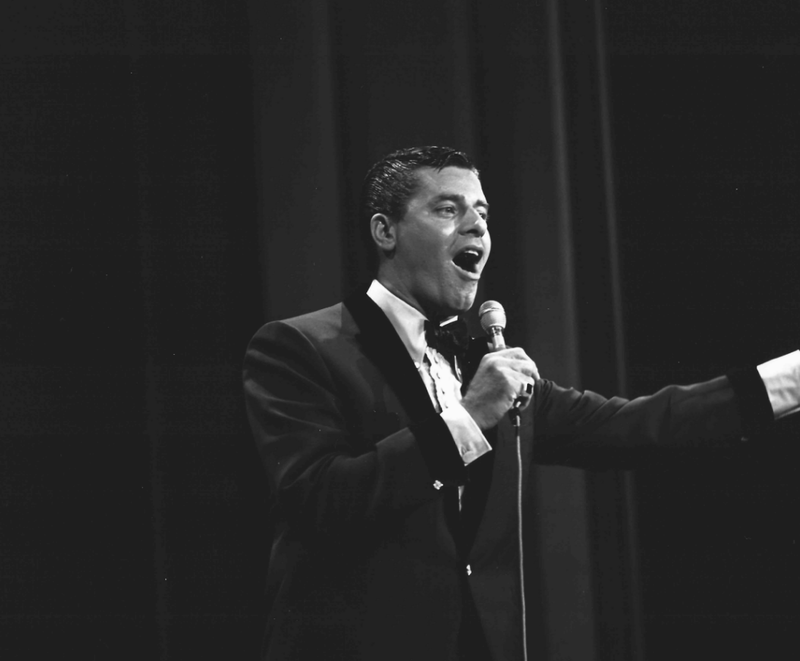 “Two Men Singing,” the act might have been called, and one has to stretch the eardrums to conceive the force of that comedy as a duet: Dean was a crooner, like Mel Torme, like Sinatra, like Tony Bennett. Jerry used a harshly tuned whine, like a human version of Jack Benny’s violin at its most romantic and like an animal in pain at other moments. Jerry was always in sympathy with the “animal” in pain. The question with Dean and Jerry was never who could sing better but which voice we preferred to hear. (I was supposed to prefer Dean, but I preferred Jerry.) Dean’s was the voice of custom, the one we had been trained to hear. Jerry’s was the voice of the new. 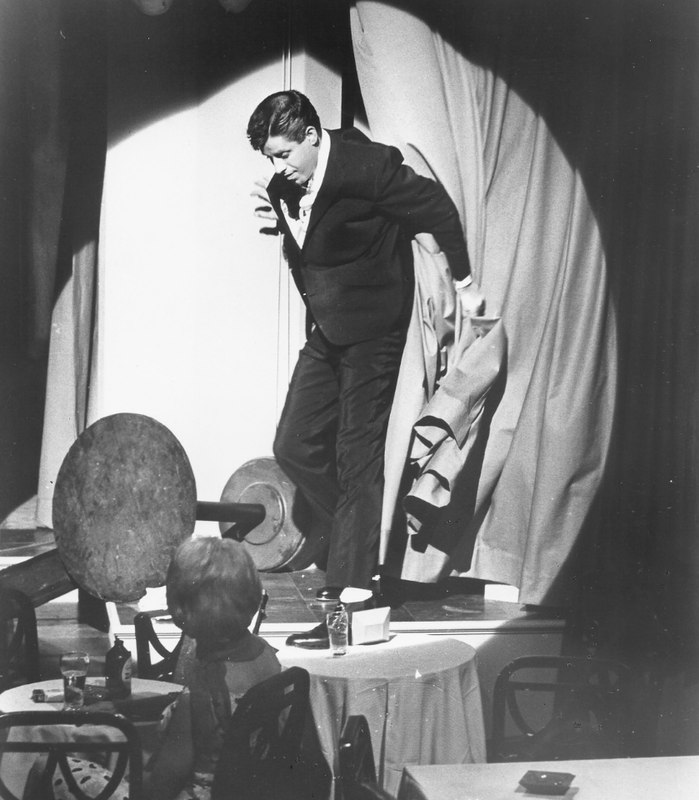 The tacit—the hidden—public presumption behind the split-up of Dean Martin and Jerry Lewis was that Jerry had clung to Dean; that Dean had been the totem pole and Jerry had been tormented slave. Thus, “I’ll go my way by myself” was a pathetic promise. But we have learned better. Jerry made a deal with Barney Balaban at Paramount (a handshake deal, nothing on paper) and then let the technicians teach him cinema. The rest is history. Martin Scorsese eulogized that watching Jerry was like watching a virtuoso pianist in performance. As a former pianist, I find this comment intriguingly apt, because in pianistic virtuosity a great deal that a performer might cause audiences to think supremely difficult is in fact not difficult at all; whereas a great deal of what is supremely difficult might be invisible, or seem merely casual to those not in the know. Scorsese’s comment reveals something very true about Jerry, who knew in his flesh, from decades upon decades of practice, how far to go: when it was necessary to strain the muscles, when not; when it was necessary to hold back from strain (because a stressful moment was about to come on), when not. He knew how to play his instrument. We may nod with dismay about the damage to his skeleton the constant pratfalls produced, and his medical therapies, but really, honestly, go into the kitchen with any hard worker who knows his stuff: damage happens. Life happens. Erosion happens. Jerry lived his life in his art, he gave his life in his art. Perhaps every Jerry fan has his own Jerry but I have surely never met a Jerry fan—and I have met many zealous Jerry fans, Jerry mockingbirds—whose own Jerry was a Jerry I recognize. To put this a little differently: the sounds Jerry made (his animal sounds, that is, his sounds of recognition that we live an animal life), that are crucial to me, are not the ones I hear people quote. I learned to love the Jerry who was in love with Anna Maria Alberghetti in Rockabye Baby. The Jerry running up and down the stairs to carry a telephone message to Dean in Artists and Models. The Jerry sternly lecturing Robert De Niro in King of Comedy, “You’ve got it. You’ve . . . got . . . it.” The Tonight Show Jerry very much, walking up with a hungry “Gnunnnng” and opening his maw to eat the camera. The Telethon Jerry, nervous, calculating, desperate for time, perspiring openly. Jerry with his mouth open in distress, but untold distress, pure distress. Jerry with Kathleen Freeman (a brilliant and frequent collaborator) or Del Moore (a brilliant and frequent collaborator). Improbable Jerry in a palpably masking clown-face in The Jazz Singer (yet how improbable, since he was a clown?). My own Jerry—not any of the many I treasure and laugh with, but the single Jerry I find both impossible and wondrous, both instructive and mystifying—is the Morty Tashman who conducts an invisible jazz band in the “board room” sequence of The Errand Boy—a film, I must confess, the disregard of which, in public statements, by Mr. Jerry Lewis, astounds and befuddles me. Here he is, at any rate, letting the band articulate the “voice” coming out of his mouth. It is mime, it is conducting, it is (almost impossibly) cigar-lighting and puffing to the beat, it is irony, it is sarcasm, it is desperation, it is supreme confidence, it is music. Oh, but Jerry was music. Jerry is music. The Jerry who was music has gone, but the music remains.